Irish or not, St. Patrick's day is the perfect excuse for gatherings and good times! ver the years it has become a day that many of our friends look forward to celebrating with us, and the crowd seems to grow larger every year! This St. Patty’s day menu is what I love to make to mark the occasion. It is sure to please the most Irish of your mates, and your non-Irish mates! Cheers to Feast & Merriment, inspired by a celebration of the Irish spirit that welcomes all to raise a glass to good times and good health. Every St. Patty’s day menu must contain a delicious loaf of Irish soda bread. Often people will serve it at dinner, but I like to put it out before dinner alongside some room temperature, European style butter. This Ina Garten recipe uses currants, not raisins, and beats out any soda bread you could ever buy at a store. 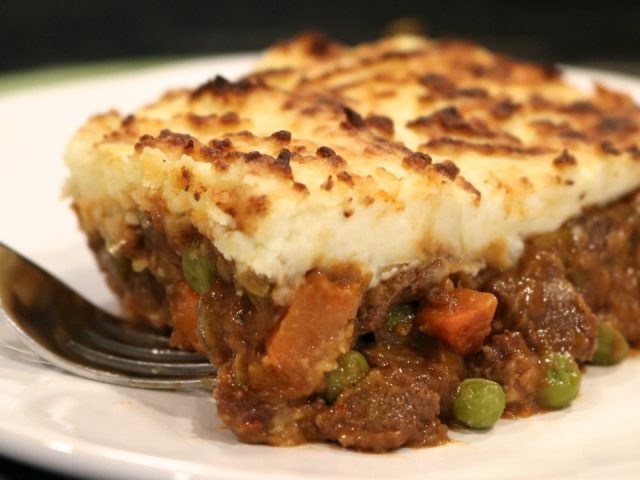 The origin of Shepherd’s Pie can be traced back to the United Kingdom, specifically Ireland. While many mistakenly believe it ‘s made with beef, it is actually made with lamb. The more popular Cottage Pie is made with beef. Being a traditionalist in the kitchen, I make mine with lamb. Learn how! Although not necessarily traditional in Ireland, corned beef has certainly become the centerpiece of the Irish-American celebration of St. Patrick’s day. And I am sure glad it did because I look forward to it each year the way most people wait for turkey on Thanksgiving! This simple recipe will have all your mates and friendly leprechauns asking for seconds! You simply must have cabbage alongside corned beef! My version of sautéed cabbage is incredibly simple, but much more refined than traditionally boiled cabbage. The carrots add color, texture and a pinch of sweetness to round it out, making it the perfect side dish for this meal.